This article was published by Duke Faith and Leadership on February 6th, 2018. I've added additional photographs for this blog post. It was a voicemail last March from my friend and former colleague Jeff Krehbiel. For 16 years, we had worked together at Church of the Pilgrims (PCUSA) in Washington, D.C. Only a few weeks earlier, he had left for a beautiful new job in Chicago. We talked for a few minutes about his tender spirit and how that would help him in the days to come. I adamantly assured Jeff that Pilgrims, though far away, would be with him as he faced his life-threatening illness. But the truth was, once I hung up, I had no idea what to say or do. How exactly would Pilgrims be with Jeff in his dying? How would I lead? More urgently, what would I possibly say to the people who had known and loved him for so many years? For 16 years, Jeff and I created liturgy together with the feisty folks at Pilgrims. In our liturgical work, we learned to tell biblical stories by heart. We created beautiful,boundary-pushing liturgies, rooted in biblical texts and our Reformed tradition. Over the coming weeks, as all of us at Pilgrims wrestled with our grief, I let liturgy lead me and ultimately the congregation through truth telling amid death and dying. Let me share with you how this worked and what we created liturgically in D.C. as Jeff was dying 700 miles away in Chicago. The lectionary gave us the story from the Gospel of John about the man who had been born blind. (link is external) I preached that Jesus affirmed the man’s belovedness with mud, water and a holy welcome. The crowd and the man’s parents, on the other hand, kept their distance. Jeff, in a sacred act of hospitality, had welcomed us into his dying, I told the congregation. We would let Jeff’s transition to death mark us so we could birth God’s holy love at a time of dying. That Sunday, we used our Lenten prayer stations as a way to respond to people living in their own uncertain and tender places -- refugees, those working to care for the planet and others. 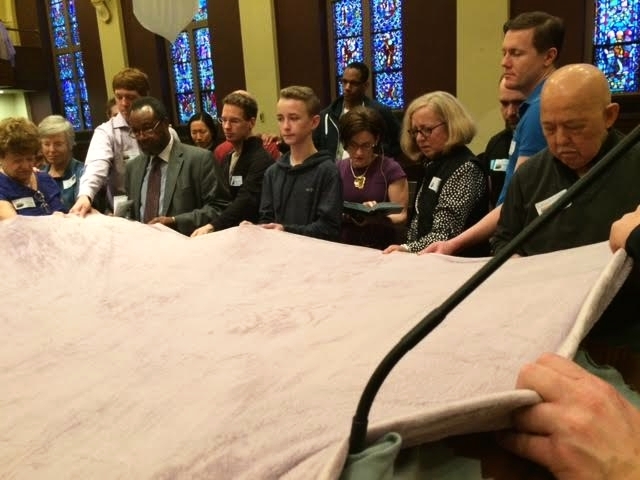 As part of our communion prayers, we blessed a fleece blanket for Jeff, stretching it out and holding it within our prayer circles as people tearfully prayed for him. Ten-year-old Jamie Ernesto prayed for Jeff’s happiness, and when our prayers shifted to the suffering in the world, he prayed for the people suffering in Syria. As we have done for several years, Pilgrims started off our Palm Sunday liturgy with a New Orleans-style jazz funeral procession around our block, with members carrying eco-palms, decorated umbrellas, drums and cardboard signs proclaiming justice. We had already sent Jeff’s purple blanket to Chicago, where he received it gratefully. Now we had three more blankets: one for Cheryl, Jeff’s spouse, and for each of his two daughters, Andrea and Kelsey. They, too, needed to be wrapped in Pilgrims’ love. The three blankets became our cloaks as we carried them with us in our procession. During our communion liturgy, we placed the blankets at the foot of our 8-foot wooden cross, its base now covered with palms. Pilgrim Diana Bruce carries one of our "cloaks" during our Palm Sunday procession. The week after Easter, I flew to Chicago to spend time with Jeff and his family. On my third and final day with Jeff, the two of us went up to the 40th floor of his apartment building overlooking Lake Michigan and planned our final liturgy together -- his memorial service. Later that morning, as we sat in the living room with Cheryl and Jeff’s sister, Sue, I realized that the time to say goodbye was fast approaching. Again, I fell back on liturgy. First, we washed each other’s hands and shared communion. Then, I asked Jeff to tell the footwashing story. Despite his weakened condition, he sat up straight in his chair and told it by heart. In that moment, I recognized Jeff’s embodied gift to Pilgrims: storytelling. We shared the bread, a baguette from lunch, and the cup, a Naked-brand berry drink that Jeff was having to boost his energy. I took my Chicago story back to Pilgrims, and the following Sunday, April 23, I shared what I had experienced and witnessed. A few days later, on Wednesday, we had a healing service at Pilgrims. We told the footwashing story and washed each other’s hands. We shared communion. 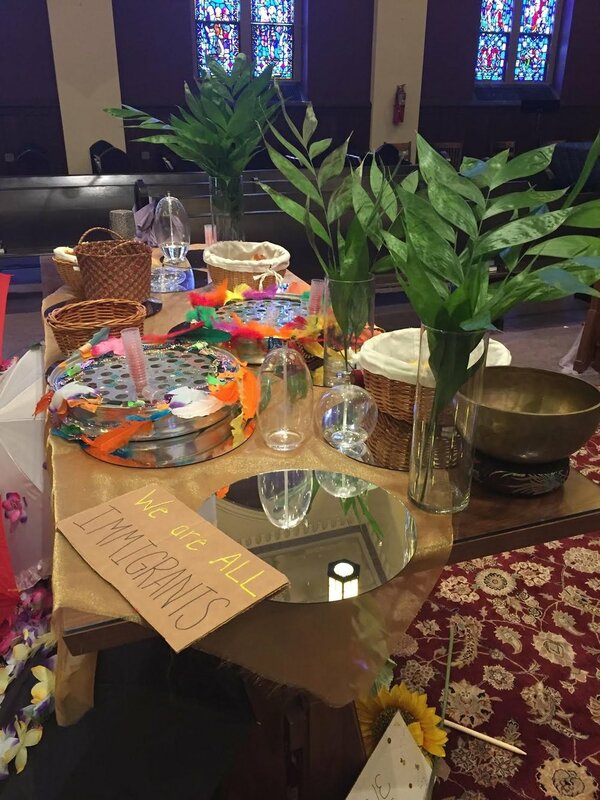 We set up prayer stations throughout the sanctuary where people could sing, process and be together. The next day, April 27, Jeff died. Nine days later, Jeff’s family and friends gathered for a service of life and resurrection. Because Pilgrims could not accommodate the anticipated crowd of more than 500, the service was held two miles away in the much larger sanctuary of D.C.’s New York Avenue Presbyterian Church. There, we sang “Marching in the Light of God,” shared communion and listened to Kelsey recount the feeding of the 5,000, carrying on her dad’s gift of storytelling. The next day at Pilgrims, we honored Jeff’s life by weaving his spirit through our Sunday worship. 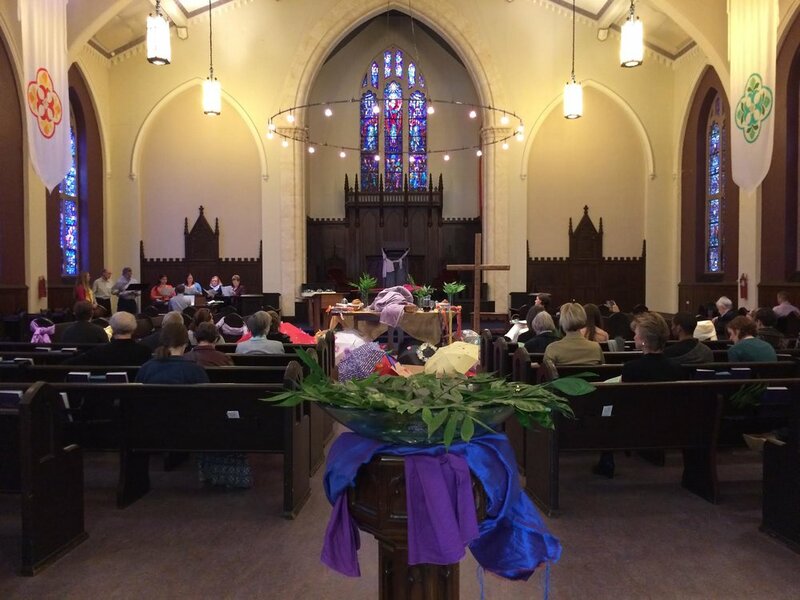 We had flowers in the sanctuary from More Light Presbyterians, an organization working for the full participation of LGBTQ people within the PCUSA. We chanted Psalm 23,(link is external) heard Acts 2:42-47(link is external) and its description of the radical acts of sharing in the early church and sang “Here Comes the Sun” with a new appreciation. We laid hands on Jeff’s siblings and his mom after they announced that they would be giving a handmade communion set to Pilgrims in his memory. We shared communion together, all of us clumped around the table. At one point, a basket of bread got separated from the cup that was supposed to be accompanying it. As Cheryl stood in the circle with a piece of bread and no cup in which to dip it, she looked right at me and smiled. “Maybe we should get some of that Naked berry drink,” she said. After communion, with drumming and our Pilgrims kids leading the way, we processed out to Pilgrims’ urban garden. Gathered together, we heard words from Cheryl, sang “What Does the Lord Require of Us” and watched Andrea “water” our garden with her dad’s ashes. Long before Jeff died, Pilgrims had become rooted in the “work of the people,” thanks in large part to his efforts. As we had learned over the years after other deaths -- and again after Jeff's -- liturgy had prepared us to trust that nothing in life and death can separate us from the buoyancy of God’s love.